Boys navy 4 piece shorts suit with tie, for baby boys, toddler or older boy, perfect for a ring bearer / page boy and other special occasions. 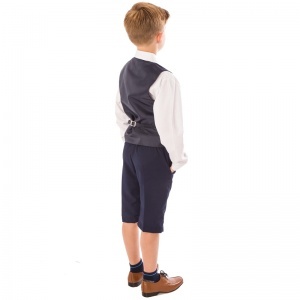 Waistcoat: Fully lined plain navy waistcoat, double pockets, centre buttons, adjustable strap/buckle on back for perfect fit. Shorts: Pleated navy knee length shorts, double pockets, belt hoops, elasticated on rear for comfort. 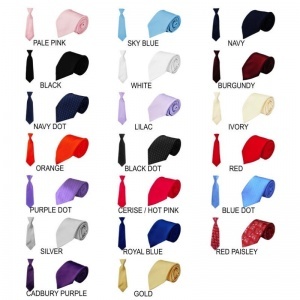 Tie: A satin tie with a choice of over 20 colours (tie on elastic for 0-4 years, 45" tie for 5-8 years), complimenting the suit perfectly. This 4 piece outfit will make him look like the perfect handsome gentleman. 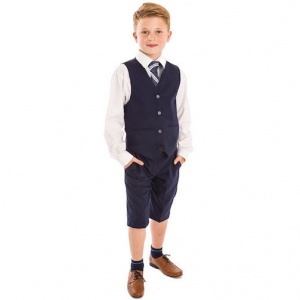 The perfect suit for a ring bearer or page boy to co-ordinate with the ushers and groom in the wedding party. 0-3 Months 8cm / 3¼" 22cm / 8¾" 41cm - 45.5cm / 16" - 18" 43cm / 17" 51cm / 20" 16.5cm / 6½" 20.5cm / 8" 24cm / 9½"
3-6 Months 9cm / 3½" 24cm / 9½" 41cm - 45.5cm / 16" - 18" 45.5cm / 18" 57cm / 22½" 18.5cm / 7¼" 23cm / 9" 27cm / 10½"
6-9 Months 10.5cm / 4" 25.5cm / 10" 43cm - 48.5cm / 17" - 19" 49cm / 19" 58.5cm / 23" 20.5cm / 8" 24cm / 9½" 28cm / 11"
9-12 Months 10.5cm / 4" 26cm / 10¼" 43cm - 48.5cm / 17" - 19" 53.5cm / 21" 61cm / 24" 20.5cm / 8" 27cm / 10½" 29cm / 11½"
12-18 Months 11.5cm / 4½" 27cm / 10½" 45.5cm - 51cm / 18" - 20" 56cm / 22" 63.5cm / 25" 23cm / 9" 28cm / 11" 30.5cm / 12"
18-24 Months 13cm / 5" 30.5cm / 12" 45.5cm - 51cm / 18" - 20" 56cm / 22" 66cm / 26" 25.5cm / 10" 30.5cm / 12" 30.5cm / 12"
15cm / 6" 33cm / 13" 48cm - 53.5m / 19" - 21" 57cm / 22½" 67cm / 26½" 27cm / 10½" 34cm / 13½" 32cm / 12½"
3 Years 17cm / 6¾" 35.5cm / 14" 48cm - 53.5cm / 19" - 21" 61cm / 24" 68cm / 27" 31cm / 12" 37cm / 14½" 32cm / 12½"
4 Years 18cm / 7" 38cm / 15" 51cm - 56cm / 20" - 22" 63.5cm / 25" 73.5cm / 29" 32cm / 12½" 39cm / 15½" 32cm / 12½"
5 Years 19cm / 7½" 39.5cm / 15½" 53.5cm - 58.5cm / 21" - 23" 66cm / 26" 76cm / 30" 33cm / 13" 41cm / 16" 33cm / 13"
6 Years 20.5cm / 8" 40.5cm / 16" 53.5cm - 58.5cm / 21" - 23" 68cm / 27" 76cm / 30" 34cm / 13½" 42cm / 16½" 33cm / 13"
7 Years 23cm / 9" 43cm / 17" 56cm - 61cm / 22" - 24" 70cm / 27½" 77.5cm / 30½" 38cm / 15" 45.5cm / 18" 35.5cm / 14"
8 Years 25.5cm / 10" 47cm / 18½" 56cm - 61cm / 22" - 24" 71cm / 28" 84cm / 33" 39.5cm / 15½" 49cm / 19" 35.5cm / 14"